Approximately four years after his birth, in 1839, the Clemens family moved 35 miles east to the town of Hannibal. A growing port city that lie along the banks of the Mississippi, Hannibal was a frequent stop for steam boats arriving by both day and night from St. Louis and New Orleans. Samuel's father was a judge, and he built a two-story frame house at 206 Hill Street in 1844. As a youngster, Samuel was kept indoors because of poor health. However, by age nine, he seemed to recover from his ailments and joined the rest of the town's children outside. He then attended a private school in Hannibal. When he was 12, his father died of pneumonia, and at 13, Samuel left school to become a printer's apprentice. After two short years, he joined his brother Orion's newspaper as a printer and editorial assistant. It was here that young Samuel found he enjoyed writing. Because the river trade was brought to a stand still by the Civil War in 1861, Clemens began working as a newspaper reporter for several newspapers all over the United States. In 1870, Clemens married Olivia Langdon, and they had four children. We are all stupid,just on different subjects. 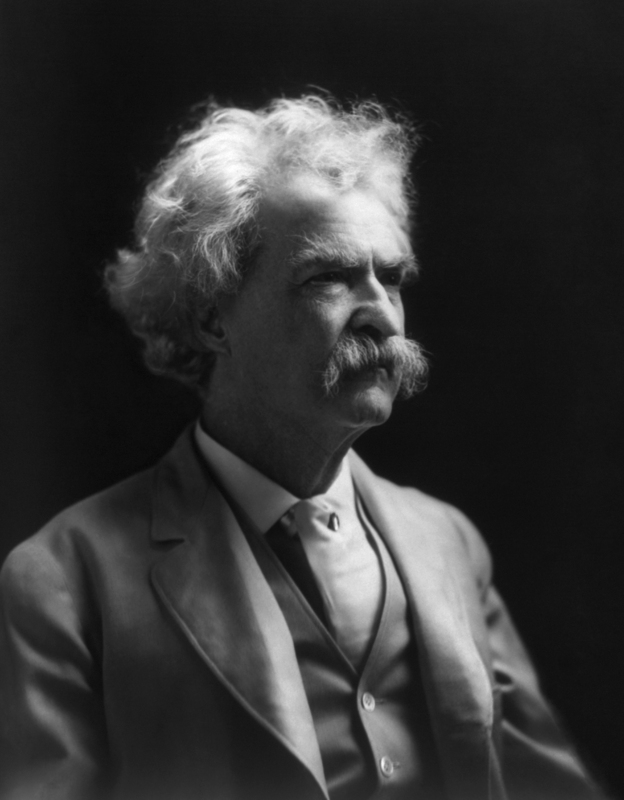 Mark Twain passed away on April 21, 1910, but has a following still today. His childhood home is open to the public as a museum in Hannibal, and Calavaras County in California holds the Calavaras County Fair and Jumping Frog Jubilee every third weekend in May. Walking tours are given in New York City of places Twain visited near his birthday every year. Never put off until tomorrow what you can do the day after tomorrow. Good friends, good books, and a sleepy conscience: this is the ideal life. Great people are those who make others feel that they, too, can become great. The secret of getting ahead is getting started. Don’t go around saying the world owes you a living. The world owes you nothing. The Bible: It is full of interest. It has noble poetry in it; and some clever fables; and some blood-drenched history; and some good morals; and a wealth of obscenity; and upwards of a thousand lies. There are many humorous things in the world; among them, the white man’s notion that he is less savage than the other savages. Man is the only animal that blushes, or needs to. April 1. This is the day upon which we are reminded of what we are on the other three hundred and sixty-four days. Let us be thankful for the fools. Because of them the rest of us could not succeed. A room without books is like a body without a soul. The two most important days in your life are, the day you are born and the day you find out why. To succeed in life, you need two things: ignorance and confidence. When you fish for love, bait with your heart, not your brain.